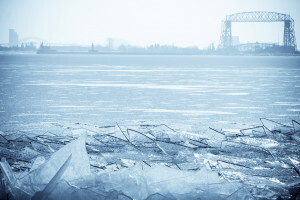 I once lived in a house made of frozen blocks of Lake Superior. You trained a muskrat to walk on a leash and recite poetry. Each time I gave our address it came out with a frozen fish. When the landlord knocked on the door, we hid in the bathtub giggling. We hung a poster over the bed of a rhino made from armadillos. There was a hole cut in the bedroom floor to let the lake breathe. All the food tasted like salted fish, even the ice cream, you said. We tore pages from the dictionary and made vocabulary birds. I dreamed Bob Dylan was a Trappist monk who ravaged our rutabagas. You wore a coat made from many an Albanian flag until you didn’t. For your birthday, I built a tiny piano out of nails and dog fur. One morning, we found sheep eating the carpet in the pantry. Afternoons, we could see an eye chart on a downtown office wall. Late at night, the lake spoke in creak and chirr, rasp and crow. John Bradley once lived two blocks from Lake Superior in Duluth. Now he lives an hour and a half west of Lake Michigan in DeKalb, Illinois. His poems been published in the American Poetry Review, Caliban, the Diagram, Hotel Amerika, the Kerf, Shadowgraph, and other journals. He is the author of seven books of poetry and prose, the most recent is Erotica Atomica, just released by WordTech.